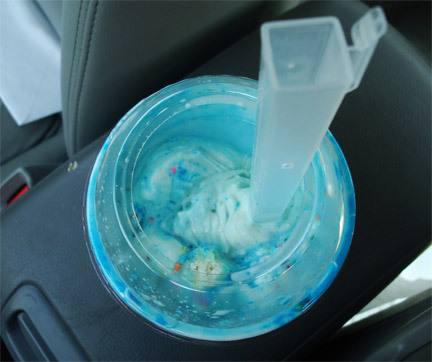 [By Nick] Don’t ask me why but ever since Dubba posted his semi positive review of DQ’s Confetti Cake Blizzard I’ve had a craving for one of them. I know what you’re saying “Nick, why don’t you go get yourself one?” Well there are two problems with your question. First, the closest DQ is about 2 hours away from me, that’s way more than I want to drive for one ice cream treat. Second, that was the blizzard of the month in May and we’re currently at the end of July. So even if I did make the trek there, the staff would look at me like I’m crazy asking for one. So what’s a guy going to do to satisfy this craving? Well looking over Friendly’s menu, it looks as if they have something possibly similar, the Birthday Cake Friend-z. I say possibly because there is literally no description of this thing at all. Hell, I can’t even find a photo of the thing online*. So I ventured over to my local Friendly’s to find out what this thing is all about. Asking the more than friendly hostess what was exactly in this concoction she was a little embarrassed not to have known herself. 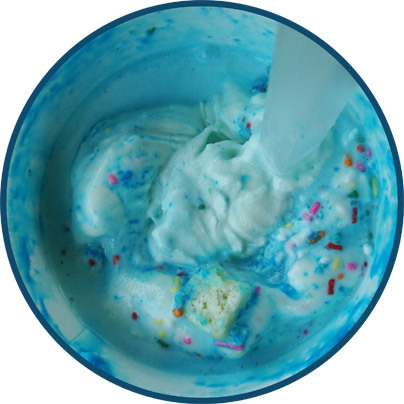 After consulting with what I assume to be the manager she informed me that it was vanilla soft serve mixed with little cake pieces, sprinkles and frosting. Eh that’s close enough for me, so I handed over my $3.99 plus tax and waited for my treat to arrive. As you can tell I took my friend-z to go because the “ambiance” of Friendly’s just isn’t my thing. Being surrounded by old people complaining about their food and little kids running around EVERYWHERE isn’t even close to appealing to me. Removing the cover, you can see all the ingredients advertised are present. I feel a little jipped though because as you can see my cup isn’t even close to full. I’m not sure if this is how friend-z’s normally are seeing as I haven’t had one in years but I feel like there could’ve been a bit more soft serve in my cup. All complaints aside, it still looks like a decently put together treat. I take my first bite and all I taste is the blue frosting which alone is a bit overpowering. Giving it a quick mixing myself, I took another bite and the flavor was a lot less sweet and worked perfectly to meld with the vanilla soft serve. Now it’s still pretty sweet but not to the point of being sickening. The cake pieces are mixed perfectly throughout and really bring a nice change of texture. It wasn’t specified but I believe they used cubes of pound cake. I ran into a nice chunk of the soft but firm cake about every other spoonful. They also have a nice chew to them as well. Now I feel like I might’ve gotten a lot more sprinkles than normal but who can really complain about that? Just looking at all those sprinkle has put a smile on your face. They are literally everywhere and there’s no way you’re going to get a spoonful without at least 10 of these buggers on it. The sprinkles alone have very little taste but the crunch complements the cake pieces. All and all I really enjoyed this treat. I don’t think I’d want it that often though because about an hour later I felt a sugar crash approaching. Looking at the nutritional facts, it isn’t all that surprising now. This thing contains 76 grams of sugar. Oh well, it was still tasty but I’d think twice about giving it to my kid if I had one.